I’ve been looking for the first roller coaster in North Carolina as part of my research into the amusement parks of the Old North State. Often, as technology changes and access to historical documents opens, you can find new and different sources. This causes us to rethink what we know and I assume that this article will be an evolving piece that will change as new facts come to light. 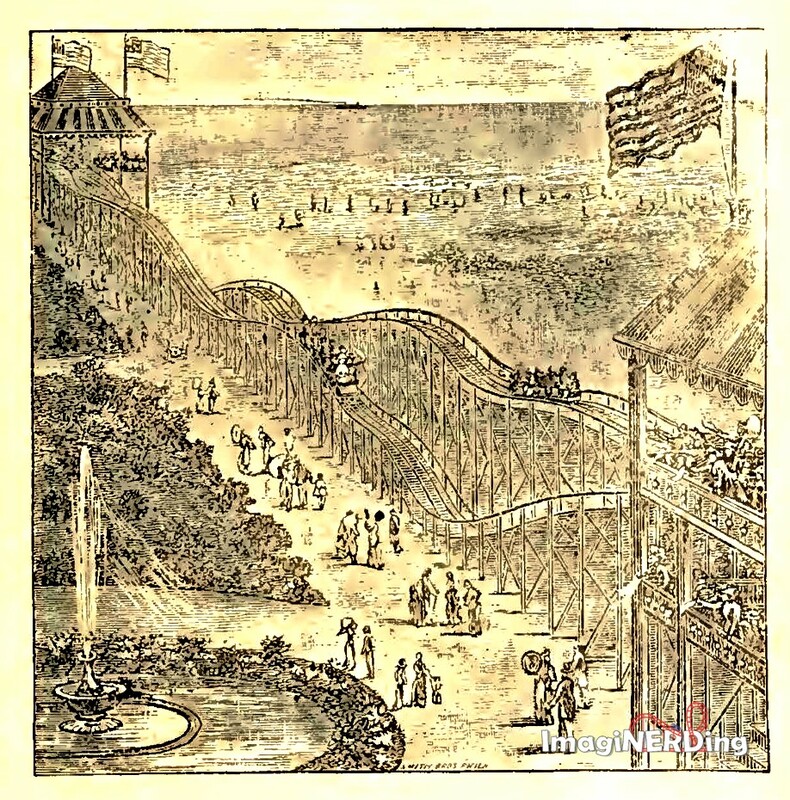 A drawing of LaMarcus Thompson’s Switchback Railway at Coney Island. So, what we know about history can change. LaMarcus Thompson is not the inventor of the roller coaster! When you do any type of research, you have to approach the sources with a cynical eye; you just can’t trust any internet resource and you often have to find a primary resource. In North Carolina, we have access to a consortium of databases paid for by the state government. One of the newest resources is historical NC newspapers from Newspapers.com. From there, I was able to search hundreds of newspapers going back to the the 18th century. 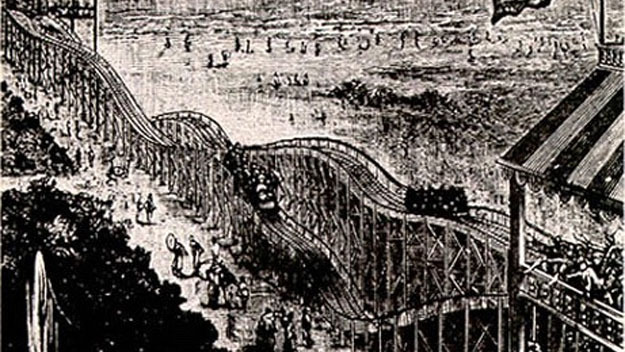 The earliest roller coasters were called switchback railways and scenic railways. Occasionally, they were referred to as roller coasters, but not as often. So, as I was searching for the terms, roller coaster showed up in The State Chronicle of 1891. The State Chronicle, June 14, 1891 – Yes, that is a typo. The roller coaster to be built at the Exposition Grounds will be the largest and nicest in the country. The State Chronicle, June 23, 1891. Workmen are building the great roller-coaster or switchback at the southeastern corner of the exposition grounds. Having the first roller coaster in North Carolina at the state capitol as part of the annual state fair makes a lot of sense. This was also part of the Southern Inter State Exposition that would take place in October of 1891. I was pretty happy with this find. Since the switchback at Coney Island by LaMarcus Thompson received a lot of press, it makes sense that it would have made its way slowly south. But I was in for a little surprise when I searched for the term switchback railway. 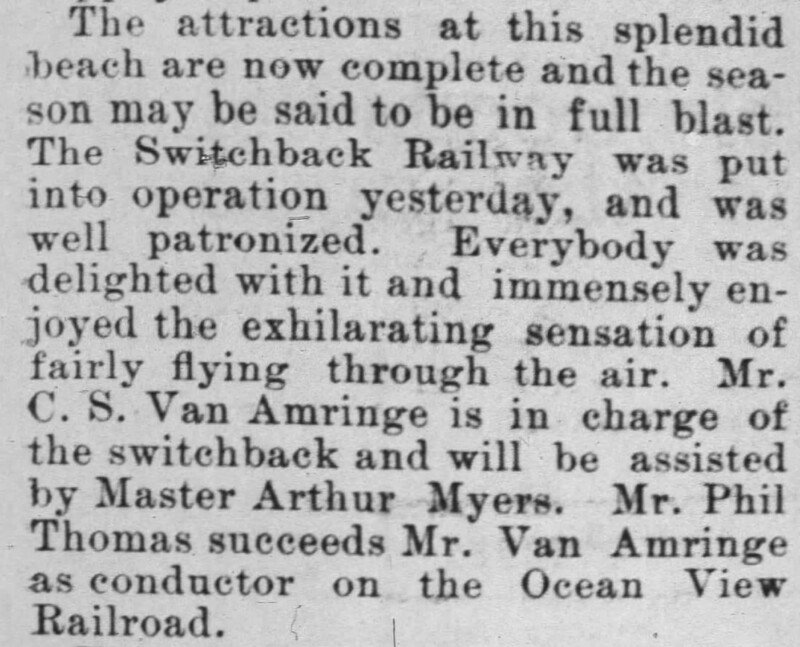 I ran across an article in the The Daily Review (Wilmington) that mentioned that the switchback railway was at the terminus of the Ocean View R.R. and would be ready for the cars. So, this could be a roller coaster or it could be an actual part of the Ocean View (or Sea View) Railroad. The first switchbacks were simply ways for trains to traverse up and down steep grades. Maybe this was just a term used erroneously for a turn-around. The Daily Review (Wilmington), May 28, 1889. 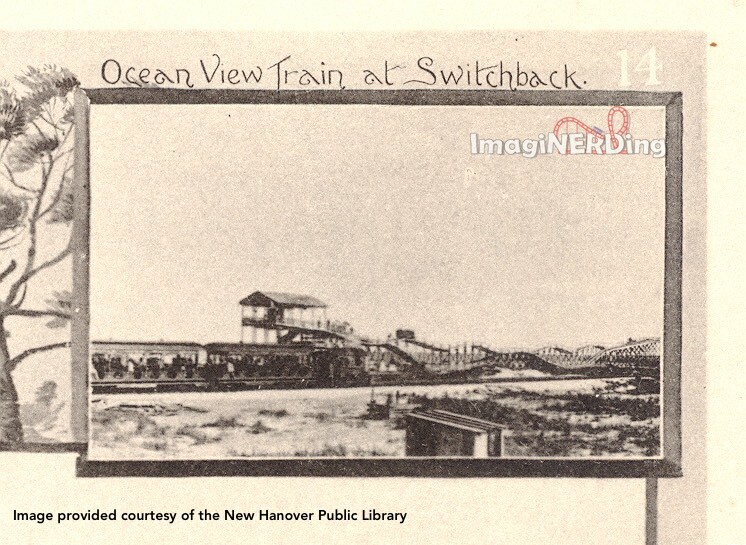 The Switchback railway is upon Wrightsville Beach, at the terminus of the Ocean View R.R., and is now ready for the cars, which will arrive in a few days. The bath houses will be open on Thursday. But the clipping does mention that the bath houses would be open. Bath houses were usually part of an amusement area, so I had some hope. Then, I found this article about Ocean View, which sounded like the beginnings of a trolley park. Like a traditional trolley park, in which the electric company created the amusement park to provide extra income, the Ocean View R.R. created the park to increase the passengers using the line. Wilmington Messenger, June 18, 1889. The attractions at this splendid beach are now complete and there season may said to be in full blast. The Switchback Railway was put into operation yesterday, and was well patronized. Everybody was delighted with it and immensely enjoyed the exhilarating sensation of fairly flying through the air. Mr. C. S. Van Amringe is in charge pf the switchback and will be assisted by Master Arthur Myers. Mr. Phil Thomas succeeds Mr. Van Amringe as conductor on the Ocean View Railroad. I think that fairly wells proves that it is the earliest mention of a switchback railway as an amusement ride in North Carolina. This makes sense when you look at the popularity of Coney Island and other seaside retreats building amusement areas to attract people. There were various mentions of people riding the switchback railway, as well as the merry-go-round, the rotary swings and the shooting gallery throughout the summer of 1889. There is also an article about a $75,000 hotel that will be built near the point where the switchback railway stands. But this happens a bit with historical newspaper databases. You are relying on optical character recognition to help you search and there are times when weeks, months or years of a paper will not be available. So, at this point (July 25, 2017), I have no sources that show what happened to the 1889 switchback railway at Ocean View. First Roller Coaster in North Carolina: Update! I reached out to the New Hanover Public Library (Wilmington) and asked if they had any information about the Ocean View. They responded with a 12 page document from the Bill Reaves Collection (BRC) that focused entirely on the Ocean View. I quickly devoured it and I was surprised with some of the details. The Ocean View Railroad was incorporated in January 1889 and work was started immediately with the construction of a bridge near the Hammocks. Building the cottages and the bath houses were not to be delayed as building material would be rafted down the channel. A switch-back or circular railroad as it is sometimes called, will also beone of the attractions, and besides there will be every attraction and amusement around and about that will go to afford pleasure to visitors. Near the pavilion at this end of the line a large cistern will be built for the purpos e of giving the people all the pure and sparkling water they want to drink. This is the first mention of the switchback and it’s even more curious, because it describes it as a circular railroad (the first circular railroad was patented in January, 1884). So, you rented your bathing suit back then and it was made of flannel. Good to know. Mr. H.B. Griffith, of Philadelphia, arrived in the city last night to put up the switchback at the Masonboro terminus of the Ocean View Railroad. The switchback will have four hundred and ten feet of circumference, and will be completed in two weeks. A switchback will be quite a novelty for Wrightsville Beach, and will be a popular institution with the big folks as well as the little ones. Wilmington Messenger, 5/14/1889. Mr. H.H. Griffiths, of Philadelphia, who came on to put up the switchback for the Ocean View Railroad, went down yesterday to begin work. He will employ thirty hands. Wilmington Messenger, 5/15/1889. Mr. Griffiths’ name is spelled differently in three different items in the Wilmington Messenger. The gentleman in question is Herman Bomeisler Griffiths (who would eventually run Rocky Springs Park in Lancaster, PA). Better yet, it is a coaster with 400 feet of track and a ten foot circumference. Fifty hands are wanted for work on the switchback that is being put up on the ocean beach. When it is finished it will be a popular means of pleasure, and will be patronized all the time. It is said that there never has been an accident on one of these switchbacks since they were invented, although they are now in use at every popular watering place in the United States. Wilmington Messenger, 5/16/1889. On May 21 or 22, 1889, the Ocean View Railroad began operations. The switchback railway was ready for the cars on May 29, 1889. They were being delivered from Philadelphia. They arrived in Wilmington around June 14, 1889. So, the very first roller coaster in North Carolina began operations on June 17, 1899, as mentioned in the clipping from June 18, 1889, above. As I mentioned earlier in the article, the next coaster would be built in Raleigh in 1891. It would be very well attended and operate for most of the year, even when there wasn’t a state fair or exhibition. Sadly, in April of 1893, the roller coaster in Raleigh was involved in an accident when a car jumped the track. It would be torn down in October of 1893. This is one of the attractions on the State Fair Grounds, and is a universal favorite amusement. Two long undulating tracks connect two pretty towers four hundred feet apart, and the cars go from one tower to the other with lightning velocity and perfect safety. It is a railway whose cars have Nature for an engine and Amusement for a conductor—no steam, electricity, or any other motive power. It is easy to understand how and why a car will run down hill itself; but it is startling to see them shooting up the steep inclines by their own force, and to such an extent that in traversing the length of the road, precipitous as it is, the passengers are landed safely at the other end, screaming with delight, having accomplished the seeming perilous journey of four or five hundred feet in thirteen seconds. The sensation is delightful, and starts every nerve into new activity, causing the blood to circulate more freely, and thus adds new life and vigor to young and old. Five cents pays for a ride and the popularity of the amusement will be appreciated when it is stated that one of these railways at the Richmond (Virginia) exhibition in 1889 realized $,5 000 in thirty days. This is not a switchback railway in North Carolina, but it is pretty amazing to see the switchback in action from this 1898 film. They barely went 6 MPH and had a height of about 40 feet. The perspective looks skewed in the film. Both platforms would be at the same height and would allow enough velocity for the car to reach the top of the other side. Then the workers would switch it to the other side and load it. It’s hard to imagine how revolutionary this ride was. The earliest ones, from the 1880s, would have a mechanical lift to return the car to the top (or it would be hauled up by the workers). The First Roller Coaster in North Carolina: what’s next? A few years ago, this type of research would have been nearly impossible. Serendipity being the only way of discovering of many of these smaller news items. Days spent scanning microfilm rolls at the public library have been supplanted by careful searches of online databases and the ability to compile and interpret information. That being said, this article is definitive as of the date of publication. Revisions will be forthcoming as new articles, photos and anecdotes come to fruition. What am I looking for, next? Fascinating article. I love roller coaster history. I don’t get to Wrightsville often anymore, but I remember as a child the Oceanic restaurant, on the site of the historic hotel, had many old photos of the area including the trolley line. They might have photos of the park.